The radiographic findings include mild subtrochlear sclerosis subjacent to the trochlear notch and radial incisures of the ulna (radio-ulnar articulation) in the lateral view. A small osteophyte is visible on the proximo-caudal aspect of the anconeal process in the flexed lateral view. No abnormalities are detected in the cranio-caudal view. These findings are consistent with elbow osteoarthritis. Based on these radiographic findings, the presence of elbow effusion, and poor response to previous medical treatment, diagnostic elbow arthroscopy is indicated. Further imaging studies such as CT and/or scintigraphy could be considered prior to arthroscopy to attempt to document a fragmented medial coronoid process (FMCP), however the sensitivity and specificity of imaging is not as high as that of arthroscopy. 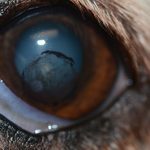 Diagnostic arthroscopy with fragment removal is the standard of care for dogs with lameness referable to the elbow, secondary to FMCP. 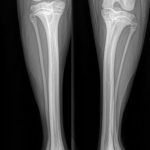 Some cases of elbow related lameness have little or no radiographic evidence of osteoarthritis (Punke 2009), and in these cases, advanced imaging such as CT, scintigraphy, or arthroscopy can be used to document and treat the pathology. Recent evidence suggests that fragmented medial coronoid process may occur due to microfracture of the subchondral bone (Danielson 2006). These microcracks disturb the mechanical properties of bone, and if not repaired properly through the normal remodeling process, accumulation of microfractures can lead to overt fatigue fracture, resulting in osteochondral fragmentation, or FMCP. Several possible causes of microfracture are possible, including elbow incongruity, force generated by the biceps/brachialis complex during contraction (Hulse 2010), and repetitive loading such as landing from a jump, referred to as jump down syndrome. 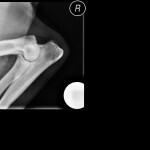 The prognosis for dogs with fragmented medial coronoid process secondary to canine elbow dysplasia is good for pet level function. In one study of 271 joints treated arthroscopically, the results were good in 60% of cases, with no lameness even after heavy exercise, satisfactory in 29%, with temporary lameness after rest or exercise, and unsatisfactory in 11% with permanent lameness (Meyer-Lindenberg 2003). 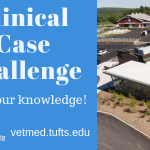 Since this is an adult dog with presumed jump down syndrome, the prognosis may be better, since the degree of pre-existing osteoarthritis is minimal. Bilateral elbow arthroscopy was performed. 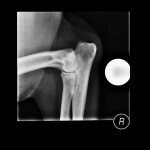 A large fragmented medial coronoid process was identified in the right elbow. Due to its large size, it was divided with a small osteotome, and removed in several pieces. The adjacent intact bone was debrided with a curette. Minimal cartilage erosion was evident in the remainder of the right elbow (see video, below). The left elbow was arthroscopically normal. Strict exercise restriction for six weeks, oral NSAIDs as needed, and administration of a high quality chondroprotective agent was recommended. 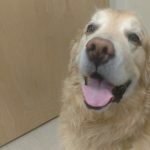 Boomer was re-evaluated 6 weeks following arthroscopic surgery, and lameness had resolved; he was slowed returned to normal activities during weeks 7-12. Danielson K, Fitzpatrick N, Muir P, et al., Histomorphometry of fragmented medial coronoid process in dogs: A comparison of affected and normal coronoid processes, Vet Surg 35:501-509, 2006. Hulse D, Young B, Beale B, et al., Relationship of the biceps-brachialis complex to the medial coronoid process of the canine ulna, Vet Comp Orthop Traumatol 23:173-176, 2010. 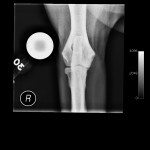 Meyer-Lindenberg A, Langhann A, Fehr M, et al., Arthrotomy versus arthroscopy in the treatment of the fragmented medial coronoid process of the ulna (FCP) in 421 dogs, Vet Comp Orthop Traumatol 16:204-210, 2010. 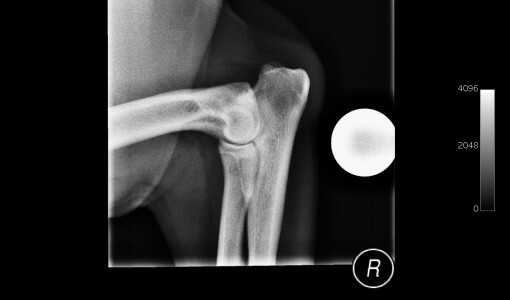 Punke JP, Hulse DA, Kerwin SC, et al., Arthroscopic documentation of elbow cartilage pathology in dogs with clinical lameness without changes on standard radiographic projections, Vet Surg 38:209-212, 2009.